is director of the Self and Existential Thoughts and Observations (SETO) Lab and assistant professor of psychology at Colby College in Maine. 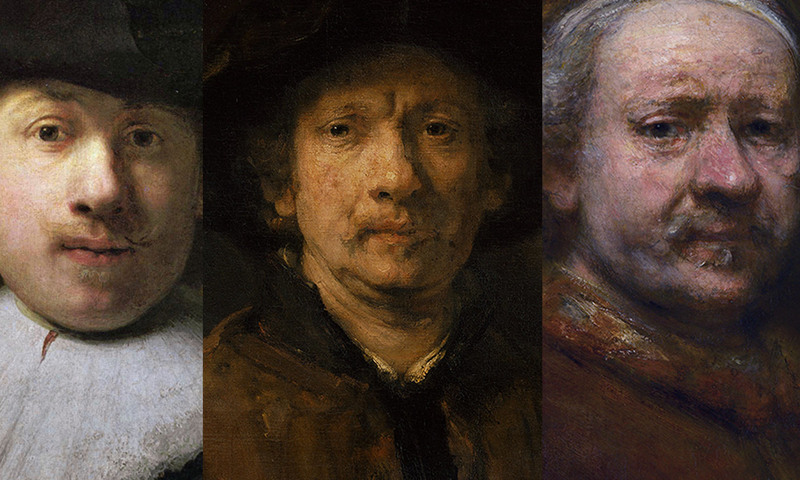 Three self-portraits by Rembrandt van Rijn: at 26; at 46; at 63. Courtesy Wikimedia. It is a common exhortation: live authentically. But what does authenticity actually mean? As a psychological concept, authenticity simply means embracing who you really are, at your very core, and acting in accordance to your own values and beliefs. Many social psychologists, such as myself, also take a layperson’s approach to the definition. In other words, authenticity is a subjective judgment. Only we ourselves are privy to when we are behaving authentically or not. Do people judge themselves to be more or less authentic over time? My inclination is that people believe they are becoming more of their true self as time passes. After all, most of us would like to think that we are growing and changing in positive ways. And the constant bombardment of messages to be ‘true to ourselves’ can suggest that some force prevents us from fully expressing who we really are. As we get older, perhaps we experience more freedom to be the real us – the freedom to overcome whatever it is that compels us to hide behind a façade and to become more of the true self we see ourselves to be. In our recent research, my colleague Rebecca Schlegel and I set out to test whether people believe their sense of authenticity changes over the course of their lives. Driven by the intuition that finding and expressing one’s true self is a common goal, we predicted a positive progression of authenticity across time. People would see themselves as becoming closer to their true selves over their lifespan. There are also different forms that changes in authenticity might take. One possibility is a simple linear progression of authenticity in which people perceive themselves as becoming more their true self as each day, week, month, year and decade passes. This is based on our tendency as humans to self-enhance: we have a strong and natural desire to view ourselves positively. Alternatively, it is possible that people perceive an authentic progression and then a subsequent plateau. This is what researchers refer to as the ‘end of history’ illusion where people believe they have become more authentic from the past to the present, and at a certain point will change relatively little in the future. They will reach a point of ‘peak authenticity’ in their lifetime. We tested these competing possibilities in a set of studies published in the journal Self and Identity. In our first study, participants from a large university were asked to think about how their true selves relate to three temporal self-concepts: past self (who they were when they graduated from high school), current self (who they are right now), and future self (who they will be at the end of the academic semester). They were then presented with pictorial representations that consisted of eight pairs of Venn diagrams that displayed an increasing amount of overlap between their ‘true self’ and the temporal self-concepts. The greater the overlap between the two circles, the greater each temporal self-concept encompassed one’s true self-concept. Participants reported the least true self overlap with their past self, followed by the current self and future self. In other words, people believe they are becoming more authentic over time and will continue to do so in the future. This is particularly remarkable, from our vantage point, given that these self-evaluations were made over a short period of time in people’s lives (ie, five to six months). In our second study, we examined whether people perceive increasing feelings of authenticity across the entire life span. We recruited a diverse age-range of participants from Amazon Mechanical Turk, and asked them to think about their life as if it were a book or a novel, organising periods in their life story into chapters like a book, and completing true-self and authenticity measures for each chapter of their life story. Following this task, we asked participants to contemplate what comes next in their life story: the future chapters in their life story. They completed the same true-self and authenticity measures for their future chapters. Time turned out to be associated with greater perceptions of authenticity. The pattern was cubic in nature, meaning that perceptions of authenticity sharply increased in the few chapters preceding the current chapter and continued to increase through the first few future chapters. Although this trend was somewhat unexpected, I personally suspect that this reflects a period of self-exploration where people are searching and perhaps succeeding at ‘finding themselves’. Similar to findings in our first study, people tend to believe that they are getting closer to their true selves over the course of their lives. Evidence from both studies favours the self-enhancement explanation of perceived authenticity across time. Given that authenticity is a subjective judgment about how closely one’s everyday actions mirror the true self’s values and beliefs, these studies suggest that our perceived sense of authenticity is continually changing. We do not think of ourselves as stagnant beings. Moreover, people hold positive expectations that they are constantly moving towards becoming their true self, and they place immense value on knowing and expressing who they really are, so much so that they believe their future selves will be a more authentic version of their current selves, and their current selves are more genuine than their past selves. Finally, it is important to note that our sample consisted only of participants from the United States. While authenticity might be thought of as a uniquely Western notion, previous research has shown that the experience of state authenticity (and state inauthenticity) are similar in both Western and Eastern cultures. This means that it is likely that these feelings of authentic progression over time are universal. Authenticity will continue to be a buzzword for centuries to come, and people will never stop promoting the importance of being one’s true, authentic self. The only possibility of this happening is perhaps when our subjective review of authenticity finally tells us that we are the closest to who we see ourselves to be.